Today and yesterday were days to shift things here and there and everywhere. We have company scheduled next weekend, so we are making a big push to get the house somewhat looking like we did not just move in. I don’t think we will achieve that lofty goal, but we might have fewer boxes to walk around. The continuing to move has required shifting of stuff from this spot to that – just to have room to work on the room de jour. But that usually results in at least of few of the shifting boxes being unpacked as well. Today we moved our (Carl’s) albums (records, LPs, vinyl) from the middle of the floor to spaces around the edge of the dining room. I am not sure this will be their final resting spot, but it did get them out of the main walkway. Art was unpacked and is now scattered around in different rooms, trying to find a home. Bedding has been mostly unpacked. And some of it left our home to find homes with other people who need blankets. I got a few new blankets to fill the void, and a couple of bedspreads for the finishing touch. There are still a few more boxes to unpack, but the number is definitely decreasing. The Recycle Truck is getting quite a load from us tomorrow. 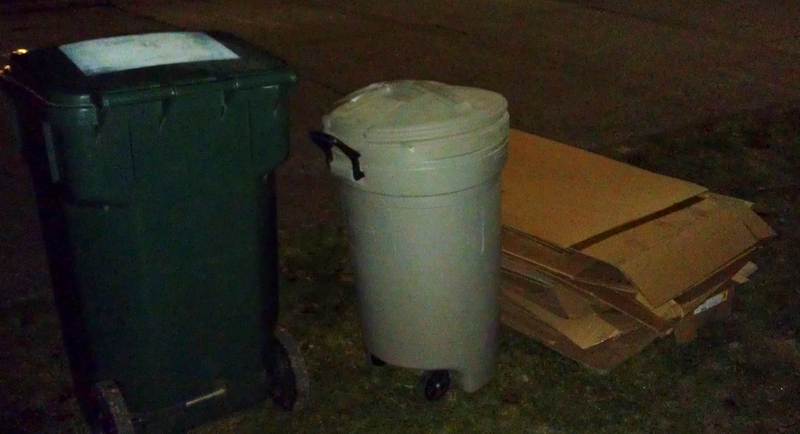 We piled all of the boxes on the lawn, filled an extra garbage can and of course put out the regular recycle bin. Sorry about the dark picture, but it is dark out there. The pile doesn’t look that big in the picture. Perhaps I should have had Carl lay across the pile for scale. And curtains were purchased for the room with the computer. Not hung yet, but the curtain rods were also obtained today. And we took a walk – used the walk to do a little Christmas shopping. This year has been a bit hard to get started on the seasonal stuff, but hopefully it will all come together in the end. And the last storage unit is down to items that we hope will not see the inside of our house again. Sort of stream of consciousness here, and I am sure I have missed a thing or two or twelve. time to do some laundry. This entry was posted on December 8, 2013 at 7:05 pm and is filed under Uncategorized. You can follow any responses to this entry through the RSS 2.0 feed. You can skip to the end and leave a response. Pinging is currently not allowed. Here is a holiday suggestion, leave the boxes and just stick a bow on them. I need to get rid of lots of things too–it takes a lot of energy and time to figure out where they should go. I’ve already done a lot this past year and it’s worn me out emotionally.